Video Event of the Week: Might Warner Home Video's Blu-ray featuring both the 1973 original AND 2000 director's cut of William Friedkin's horror classic The Exorcist be what we're talking about? Could Fox's DVD box set of The Mary Tyler Moore Show: The Complete Seventh Season actually make the cut? Or could -- and I think this laughably unlikely -- might Sony's various disc versions of The Karate Kid, the thoroughly pointless remake of the 80s hit now featuring Jackie Chan, by any chance be The One(s)? All worthy, actually, even that Karate Kid deal which, on its own superfluous terms, is a surprisingly agreeable time-waster. 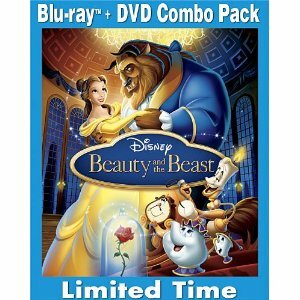 But for my money it's simply got to be Disney's three-disc Blu-ray/DVD combo pack of Beauty and the Beast, the animated 1991 musical that seriously upped the ante on the genre. B&TB was the second film of the so-called Disney Renaissance (the first was The Little Mermaid), the period when the studio reinvented itself as THE gold standard for animation after a disappointing (a mild word, really) series of misfires like the recently re-issued Black Cauldron. For their adaptation of the classic fairy tale by Jeanne-Marie Le Prince de Beaumont (credited only in the French version, BTW) the studio went for broke with a still impressive -- and at the time highly innovative -- blend of traditional hand drawn and computer animation, a score by the incomparable team of Alan Menken and Howard Ashman (the auteurs of Little Shop of Horrors), and an amazing cast including Angela Lansbury and (most memorably) the late Jerry Orbach, as a singing candlestick whose unctuous Charles Boyer-esque charm steals just about every scene he's in. The aforementioned computer animation, incidentally, is particularly impressive in the film's biggest production number; if you haven't seen B&TB previously I won't spoil the surprise effect by telling you which one it is, but let's just say it was jaw-droppingly effective when seen on the big screen, and (thankfully) no less so in the film's to-die-for gorgeous digital refurbishing on the current discs. Here's the reissue trailer to give you an idea of what I'm raving about. Disney (or anybody else, actually) has yet to surpass this one, and given that Howard Ashman died shortly after the film's release, it's unlikely that anybody will any time soon. Fortunately, for this new edition, the studio has pulled out all the stops. Along with the aforementioned spectacular new high-def video transfer of the original theatrical version, bonuses (on the DVD and Blu-ray respectively) include an extended version with a previously unseen musical number, and the film's original storyboards. You also get the proverbial plethora of deleted scenes, outtakes, and making-of documentaries, plus (on the Blu-ray) a newly mixed 7.1. surround sound track. The film itself remains the main attraction, of course; let's just say that if you don't find yourself in tears at some point while watching it, I probably don't want to know you. In any case, you can order it over at Amazon here, and I would suggest you do so as soon as humanly possible. And that said, and given that things are doubtless going to be quiet around here for a couple of days, I regret that real-world obligations have made it impossible for me to get a proper Listomania together this week. Best or Worst Feature Film Featuring a Talking Animal or a Human/Animal Hybrid.